Growth is not a word that you would normally associated with AT&T (NYSE: T). I mean over the last decade earnings-per-share growth has been non-existent in real terms. Back in 2007 the company made around $2.75 per share in after-tax profit. As of last year that figure had only grown to about $3.05. For a lot of folks that statistic would be enough to mark the end point of their consideration of AT&T stock as a decent investment. Young investors in particular fall for this ‘growth trap’; the idea that high earnings growth results in large shareholder returns. It does not (at least not necessarily anyhow). At this point I will give another shoutout to Dr Jeremey Siegel and his book – The Future For Investors: Why The Tried And The True Triumphs Over The Bold And The New – because the growth trap is really counterintuitive until you see a real example. A good one is Royal Dutch Shell. Between the late 1950s and the early 2000s Shell stock compounded wealth at an average rate of around 13.5% per annum. It did so despite average annual of earnings-per-share growth of ‘just’ 6.65%. How? First of all the average earnings yield was pretty high at about 8%. Secondly, it paid most of that out as cash dividends and did so reliably, come rain or shine. Indeed Shell’s average dividend yield over that time clocked in at 5.25%. Sticking with the oil patch how about another example? Between 1950 and 2003 Standard Oil Of New Jersey, which went on to become the “Exxon” part of Exxon Mobil, grew its earnings per share at an average annual rate of approximately 7.5%. Total shareholder returns, however, outpaced that by a whopping 6.9 percentage points per annum for the same reasons set out above. This is the blueprint for AT&T going forward. As it stands the stock is trading at just under 9x prospective 2018 net profit. Put another way, that is an earnings yield of over 11% straight off the bat. You don’t even need any organic growth here to make very tidy returns for a stodgy blue chip stock. It just has to keep doing what it’s currently doing. Oh and the dividend yield is currently around 6.6%. Okay so what gives? An earnings yield that is over 11% – essentially implying we don’t need any organic growth to lock in double digit compound annual returns – is too good to be true, right? To answer that question most folks would point you toward the balance sheet. One of the consequences of acquiring both Time Warner and DirecTV in the space of a few years is whopping levels of debt. As it stands the headline figure is around $175 billion net of cash. If we divide that into the 7.3 billion shares of AT&T currently in existence we get a per-share net debt figure of around $24. Tack that on to the current share price and we get a debt adjusted P/E ratio of 15.5x annual profits. Despite the debt situation I remain optimistic. As I’ve commented before debt reduction is a prize in and of itself given the annual interest bill. This year, for instance, AT&T will throw off free cash flow of around $21 billion. That is a company estimate and probably fairly accurate. Now, as it stands it is also paying something like 4.5% per year on its net debt load. Let’s call that $8 billion in total. In other words an amount equivalent to 40% of annual free cash flow is going to bondholders rather than shareholders. The good news is the cash flow situation is fairly solid. I covered that about a month ago so I won’t go over the numbers again but the bottom line is that there should be around $7 billion per year right off the bat for debt reduction. 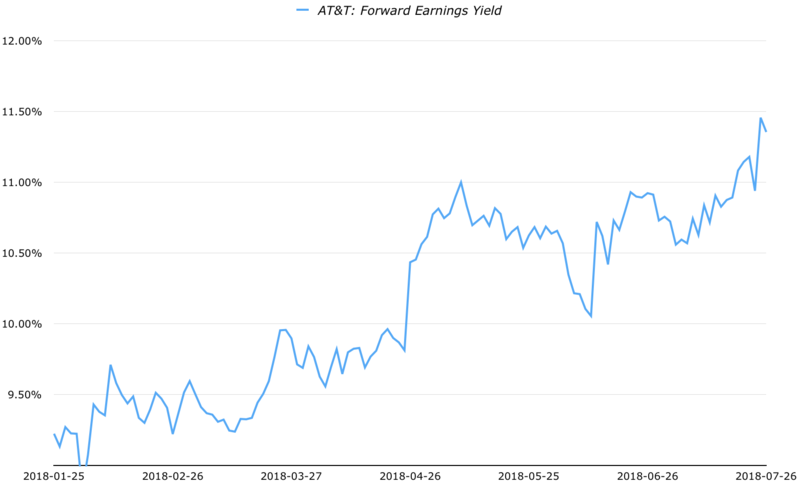 Now, let’s suppose AT&T can reduce its interest bill by 40% within a decade without a dividend cut; a realistic proposition given its cash flow generation. On its own that would be worth around forty-five cents per share, which is roughly equivalent to a 13% boost to current annual earnings per share. Spread over a period of a decade that equates to around 1.25% per year on average. Doesn’t sound like much, but remember that’s on top of an earnings yield that is already sitting above 11%. Don’t be put off by the low growth prospects, there is more than enough value to make things work out very well for those buying today.